Visual instruction for 300 crochet stitch patternsThis visual encyclopedia features step-by-step instructions for 300 gorgeous crochet stitch patterns, from basic stitches to cables, lace, textured stitches, mesh and filet crochet, fans and shells, clusters, puffs, bobbles, spike stitches, colorwork, and more. Each pattern is accompanied by a full-color photo and a chart. 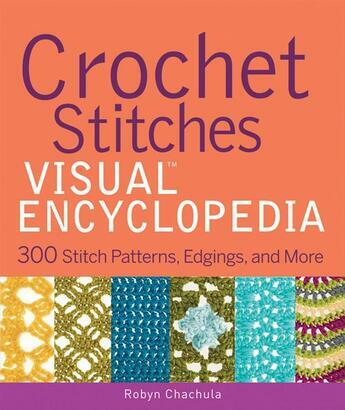 Every crocheter needs a book like this on her shelfthe content is timeless and will have a place next to the crochet hooks for many years to come.Crochet Stitches VISUAL Encyclopedia gives crocheters quick visual access to a comprehensive collection of stitch combinations that enables them to create their own designs or modify existing patterns with ease.Patterns are represented in both charts and words to suit individual crocheters preferencesA detailed color photo accompanies each stitch patternHardcover packaging makes the book durable for a lifetime of useWhether you're a beginner or anadvanced crocheter, Crochet Stitches VISUAL Encyclopedia is a book you'll turn to again and again.